Do you wake up and feel your skin has lost all its goodness? Well, Pollution and sub-standard make-up are the key reasons. They make it look withered. There is definitely no way one would stop going out or looking glamorous because of the side-effects caused. Just follow a routine vanilla brulee clean-up to nourish your skin with an unmatched glow. Ok, so can you imagine a waffle cone filled with creamy vanilla ice-cream? That’s an all-time favourite right? Now can you see how clear and smooth it looks? Yeah. Well, this exotic treatment will help you get rid of all that stubborn dirt that won’t go away. With creamy Madagascar vanilla-seed extracts, our Vanilla Brulee Clean-up gives you a very smooth skin instantly. It helps to exfoliate all the dead skin. It squeezes out all the toxic substances and makes your skin look more radiant and healthy. Highly recommended for dry skin, this one is a special edition to our set of unique services. Just Flaunt is the first salon in Hyderabad to bring to you a unique clean-up of this nature. Given all the premium products used, the prices are very pocket-friendly. In fact, don’t forget to ask for our Happy Hours Special Prices. A team of skilled professionals at your service will add all the magic you need. 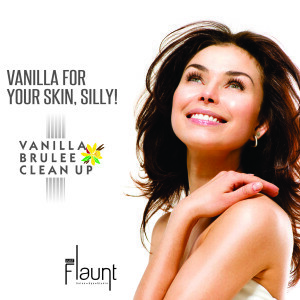 Vanilla Brulee clean-up is great for all skin types. So, this wedding season why be any less brighter than the bride. Sparkle your true self and make those heads turn. Now that we have got it all covered for you, take that bag and make a move. You don’t get these services every day. Do you?